Performance Time: Approximately 30 minutes, 29 pgs. CHILDREN’S HOLIDAY. Based on a true story, this heart-warming play brings forth the true meaning of the holiday season. 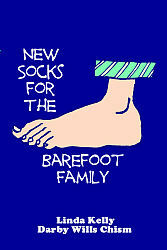 It’s a new school year at Monkey Shines Elementary School, and Mrs. Kelly’s students are working hard to raise enough money before their holiday break to buy the Barefoot family socks to keep their feet warm. When Christmas Eve arrives, the Barefoot family rejoices when they open their new socks, and Mrs. Kelly’s students receive the best gift of all—the gift of giving. This play is perfect for elementary school performers. Linda Kelly is a preschool teacher, an art teacher, and a professional photographer. Ms. Kelly lives in Kennesaw, GA, with her husband Kraig, two children, and three grandchildren.